There is something about this genre that is just so fascinating to me. If you are unfamiliar with it, the stories are usually set back in Victorian times, but with technology from the 19th century, then mixed with a few fantastical elements. If that sounds very vague and ill-defined, the genre itself is hard to describe--but so awesome! Don't worry--usually the world within each book is well defined and specific. Think gears and velvet; steel corsets, clockwork and dirigibles and wait--sasquatches?! What? Ha! I think part of why I like it is because it's so unexpected. It's sort of like industrial-chic fantasy. I haven't encountered dragons in one yet, but if there was one, there's a good chance it would have metal scales and a steam engine in its belly--yet be sentient and run on its own power. But enough chit-chat--let's get to the books! 4 stars: The action doesn't let up and the setting is just so cool! Will is a boy longing for his own story to begin. His father is off building a railroad up in the mountains, and he and his mother have recently moved to be closer to him. Will loves to draw and always has a sketchbook and pencil with him. His first day off the train, he meets a girl--a tightrope walker--who works at the circus that's in town. Her name is Maren, and even though they only talk together for a moment, that moment sparks a connection. He shows her the sasquatch tooth he got from his father and she takes it, with the intent to return when he comes to the circus that night. However, he doesn't go, because a chance meeting with his dad's boss, Mr. Van Horne, results in an invitation to ride the train up to his Dad's work camp. (He does leave a message for his mother.) It's a risky sort of adventure, for his first. There are sasquatches that live in the mountains and they are vicious. A Mr. Dorian from a travelling circus is along to capture one for his show, but all the men carry guns in case of unexpected attack. Once at the camp, Will gets to help pound in the last spike of the railroad (made of solid gold.) Unfortunately, the revelry of the men at the completion ceremony sets off an avalanche...and things literally go downhill from there. The story resumes several years later, when Will's father has promoted to manager of the entire company, and Van Horne is dead. His dream of the longest, largest train ever built has become a reality. The train is called The Boundless; it is 7 miles along, with cars containing everything from a movie theater to an entire circus. Will is delighted to find that his friend from so long ago, Maren, is on board and will be performing. Yes, Will and his father are both going along on the maiden voyage. Van Horne is going along, too, in a sense. The car right behind the engine is a tomb, which holds his remains and many of his earthly treasures. The diamond-encrusted golden spike is rumored to be among the treasures. Only 2 people have a key to the funeral car: Will's father, and the guard. When The Boundless makes a stop, Will gets off searching for Maren. He doesn't find her. He does, however, witness a murder in the woods. Not only that, he recognizes the killer--and the killer recognizes him, too. 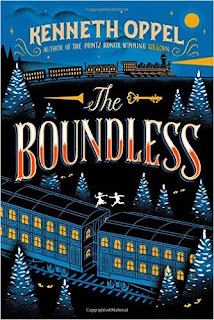 It's a man from Will's past, and he happens to also be a brakeman on The Boundless. In order to survive, Will's got to get back on the train and somehow stay out of the clutches of the murderer and his co-conspirators. If he can manage to stay alive, he's got to warn his father, who no doubt will be the next target. It's a long train, and not many places to hide, but Maren and Mr. Dorian will help...for a price. Welcome to a steampunk world where trains are still the best and fastest way to get around. 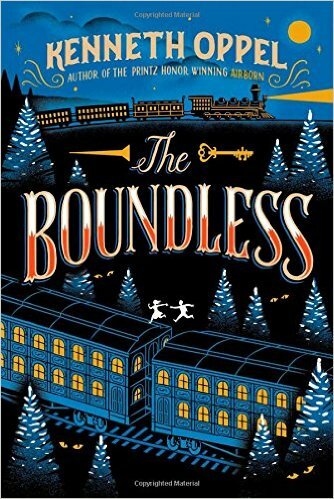 The Boundless itself is an enormous over-the-top, opulent train--sort of like the Titanic, but the train version. Also, no icebergs. In this world, sasquatches are real, and the muskeg in northern Canada has been known to devour entire settlements. There's a girl with an astonishingly real vanishing act and a painting that may be worth whatever it takes to get it. I read some reviews that said it was super boring. I'm not sure we read the same book. Trying to escape a murderer and his henchmen, jumping between cars on a moving train, plus crazy killer sasquatches!! Not to mention very lifelike mechanical puppets, a man's booby-trapped crypt of a train car, and did I mention sasquatches? Bloodthirsty ones? Maybe I just don't get out much, but I'm not seeing where the boring part comes in with all of that. I would hand this to teenagers who well, like this sort of thing. Steampunk is a thing. Look it up on Pinterest--you can do a steampunk costume for Halloween, or decorate your house in steampunk style. Start by buying some giant gears to hang on the wall, and you'll be off to a great start. Steampunk is kind of too cool for me in some ways--I'm basically the nerdy fangirl giggling on the sidelines. But you know, I'm okay with that. Content: A murder, a few violent run-ins with sasquatches, intense situations. For ages 12 and up. 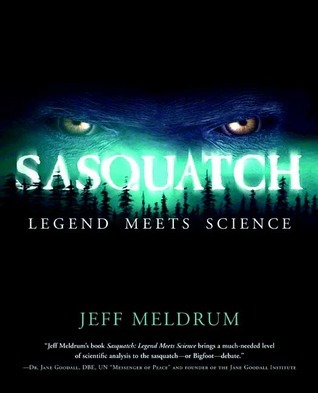 4 stars: A scientist's approach to the question of whether or not sasquatches really exist. First off--that cover is creepy and awesome all at once! I did not realize when I moved to Washington state that I was moving into prime sasquatch country! Meldrum, who happens to live very close to my little town offers compelling evidence for the existence of a large primate native to the Pacific Northwest area. He strives to keep it impartial, readily admitting the long-standing questions encircling such a claim (especially--where is one we can study up close? ), but it is obvious that he is convinced they are real. Made for some good dinner table debates! I had to add this one in here, because if you read it, I want to discuss it with you! Level with me: do YOU think sasquatches are real or not? I have heard a first-hand account of a series of Big Foot encounters in the Uintas (sightings,) then there's this book that is pretty darn convincing. My husband thinks I'm crazy to even consider the possibility! Oh hey! I actually reviewed that one 10 years ago last month! Whoa, that must be one of my oldest reviews on Goodreads. Okay, okay, we'll do this up properly. Matt Cruse is a cabin boy on a huge cruise airliner who dreams of one day piloting his own airship. He is on duty when an air balloon is spotted in need of rescue, and is chosen for the difficult task of bringing in the unconscious pilot. The pilot turns out to be an elderly man who leaves behind a journal with some fantastic drawings of animals that look like cats, but are flying through the air. Matt meets the late pilot's granddaughter, and together they set out to prove the "cloud cats" really exist. Then the airship is attacked by pirates. What's going to happen next?? Packed with exciting action, interesting details that make it seem real, and just a little bit of romance, this one is worth a try. Content: Can't help you much there--it's been a decade. If I re-read it I'll let you know more. Right here. For ages 10 and up. There you go! A 3-for-1 review special. Have you read any of these? 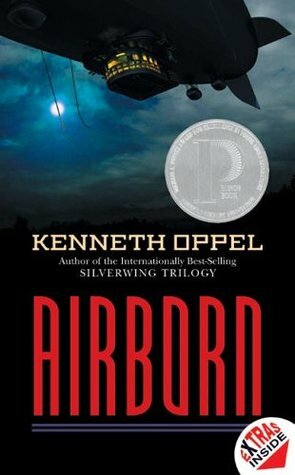 Do you have a favorite steampunk or sasquatch-related book I should read? I'm all ears!